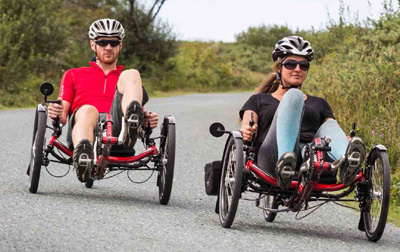 The ICE Sprint is a highly versatile sport-touring trike. 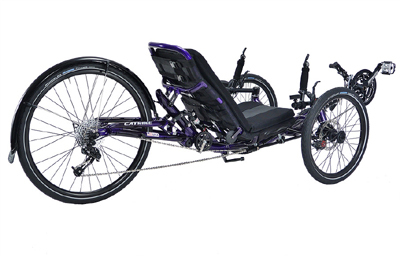 Many configuration and component choices are available, including folding and suspension. Note: As of late 2018 there has been shake-up in ICE Sprint/Sprint-X nomenclature. All “Sprint” models are now “Sprint-X” models, but the “Sprint-X” has the lightweight racing wheels while the “Sprint-X Tour” has the touring wheelset. This seems like a tempest in teacup to us. The difference between the Sprint and Sprint-X was pretty superficial, as is the difference between Sprint-X and Sprint-X Tour. Begging your pardon, we’ll just identify these trikes by their previous names. We hope this doesn’t confuse people, but it wouldn’t be the first time we’ve overestimated the intelligence of the general public. 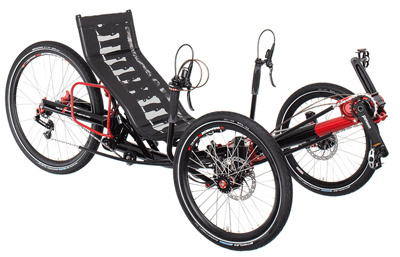 The ICE Sprint is a lower, more reclined, and more sporty trike with all the same options as the Adventure. The Sprint can be many things. 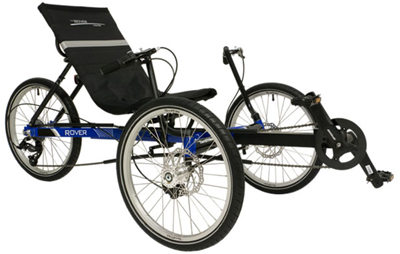 The classic form of the Sprint is un-suspended with a 26 inch rear wheel, making it a light and sporty folding trike. Or it can be set up a 20″ wheel and a more upright seat for a more casual ride. It has a lower seat height compared to the Adventure, for greater stability and lighter weight. Or set it up with full suspension for a more plush ride in either form. 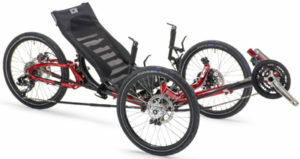 We compare the Sprint to the Catrike Expedition, a similar type, but offering folding features and an adjustable recline. It also differs from “sport touring” models from Catrike or TerraTrike in it’s indirect steering, which has a different feel. The Sprint also comes in a speed-specific spec called the Sprint X, which is available with a distinct color scheme. With its sporty ride, comfort and medium height seating position, the versatile Sprint will guarantee you are ready for the challenge ahead. 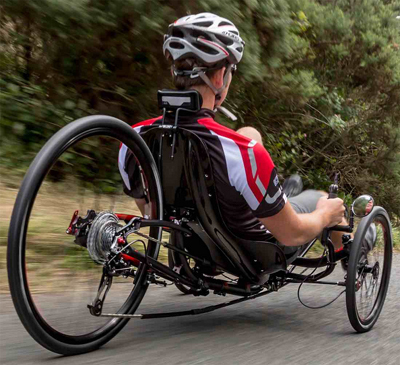 Whether you are carving bends, pushing your speed, or on a weekend tour, the Sprint is a trike for all seasons. The specialised cruciform geometry of a Sprint is enhanced with a wealth of technical features designed to deliver sporting performance, agile handling, and everyday practicality. 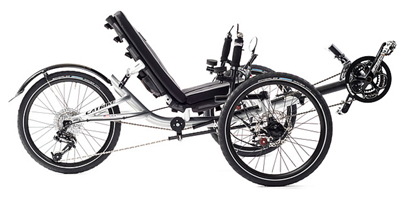 All trikes in the ICE Sprint range are built on an optimised ICE frame featuring Compact Flat Twist Fold, No Brake Steer, Rider Positioning System, and are available with wide range gearing. Depending on 20 or 26 inch rear wheel. This varies greatly depending on components and suspension options. This is how you know if you’ll fit the trike. See our discussion here. Brakes — Choose between drum brakes, which are weather sealed and give a softer stop, in 70mm or beefed up 90mm size, or disk brakes, which stop harder and generally easier to find parts for. Disk brakes are available as either mechanical (cable actuated), which are easier to work on, or hydraulic, which stop better but are more expensive and expensive to have serviced. Rear gearing — Choose between standard rear derailer, 3-speed hub with rear derailer (for super wide-range gearing), 8-speed Alfine hub, or wide ranging, fabulously engineered, rugged and ferociously expensive 14-speed Rohloff Speedhub. Crankset & Front Derailer — A selection of crank arm lengths, quality levels and chainring sizes are available depending on your needs. Front derailers match with the crankset. Seat — Standard mesh seat or Air Pro shell seat for speed, available in fiberglass or carbon fiber construction. Parking Brake — Choose no parking brake, simple Velcro straps, or a third brake on the rear wheel with a special lever. Tyres — British trikes all come with tyres, not tires. A wide selection of Schwalbe tires are available, from long-wearing to fast to puncture resistant.